Massage the cream or lotion into the feet. 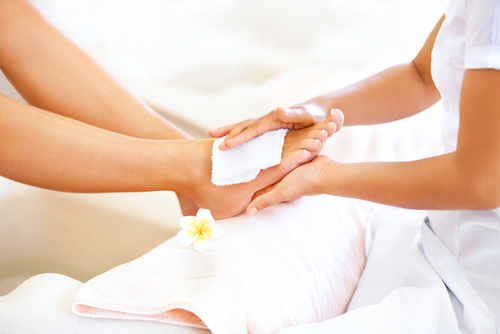 A foot massage can help relieve tension and tired, aching feet. You can get a good massage at home by rolling your feet back and forth over a rolling pin or bottle. Specialists in the body’s reflexes, called reflexologists, believe that points on the foot correspond to other body parts and ailments can be relieved through reflexology. They believe the ball of the foot has a connection to the lungs, the heel to the lower back, and the great toe to the head. Although no scientific research exists to back up these claims, reflexology does seem to produce positive results in some people.